Reports reaching Legit.ng claim that a young man identified as Monday Ali Onaivi has killed his wife and is currently on the run with the help of his mother. 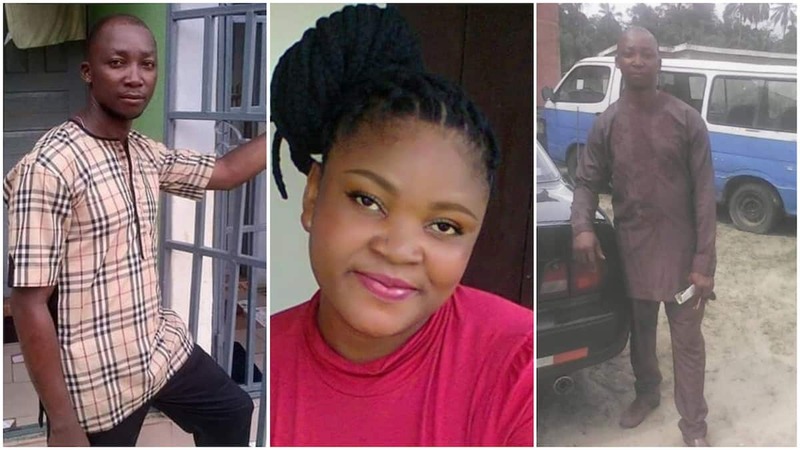 A Facebook user identified as Ejiroghene Ezaga shared photos of Onaivi and his late wife, Esther, who he allegedly set ablaze during a heated argument over upkeep money. It was reported that the incident happened in Edo, Benin city in mid March, 2019. As gathered, Ali, refused to give his wife upkeep money when she demanded and it led to an argument. During the course of the argument, the angered husband allegedly set his 33-year-old wife, Esther, ablaze and she it got ugly. An injured Esther was immediately rushed to the hospital where she eventually died of severe burns. The husband, Ali, is said to have taken to heels and is currently no where to be found. Esther left behind two daughters and help is currently being sought. Meanwhile, a . The obviously angered man took to social media to bash his wife and accused her of bringing home another man's child. Bob and his wife have been married for 12 years and reports claim that his source of infidelity news is his girlfriend who has been with lately.